WEDNESDAY, 5:34pm: Black is in fact the PTBNL in the deal, Rosenthal tweets. WEDNESDAY, 5:09pm: Triple-A reliever Vic Black is a strong possibility to be the PTBNL heading from the Pirates to the Mets, according to Ken Rosenthal of FOX Sports (on Twitter). Black is currently on waivers, but if he is the PTBNL, the Pirates can just pull him back and send him to the Mets at the end of the season rather than right away (Twitter links). In 46 and 2/3 Triple-A innings this season, Black owns a 2.51 ERA with 63 Ks and 21 BBs. Baseball America rated Black as the Bucs' 16th best prospect heading into this season. Black, who was drafted 49th overall by the Pirates in 2009, began his pro career as a starter but was plagued by control issues and converted to a reliever in 2011. BA writes that if he can get his walks under control, he has the stuff close in the majors. 8:33am: The Mets also sent the Pirates $250K in the trade, according to Jon Heyman of CBS Sports (Twitter link). That would mean the Pirates are paying just under $1MM — roughly $980K — for Byrd and Buck over the remainder of the season. 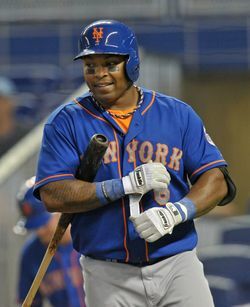 TUESDAY: The Pirates are likely headed for their first playoff berth since 1992, and they made sure to bolster their roster accordingly by acquiring Marlon Byrd and John Buck from the Mets for minor league second baseman Dilson Herrera and a player to be named later. Both teams have announced the trade. Earlier today, Adam Rubin of ESPN New York reported that in the wake of Matt Harvey's injury, the Mets were exploring trade options and had placed five players on waivers, including Byrd, Buck and Pedro Feliciano. Byrd (pictured on the right) was claimed by an unnamed NL team shortly thereafter, which clearly was the Pirates. It's unclear whether Buck cleared waivers or was also claimed by the Pirates following a season-ending injury to backup catcher Michael McKenry. Byrd, who turns 36 on Friday, is having a surprising career year despite his age. In 464 plate appearances, he's batting .285/.330/.518. His 21 homers and 136 OPS+ are both career-bests. Byrd is no longer a regular center fielder (just two games there in 2013), but his defense in right field grades out to a solid +6.6 UZR/150, and The Fielding Bible pegs him at nine runs saved. Pirates right fielders have batted just .245/.307/.368 this season, and their right field defense ranks 24th in baseball, according to UZR, so Byrd's bat and solid glove will be welcome additions in the Steel City. Byrd is also owed just $130K for the remainder of the season before he hits free agency, so he's an affordable upgrade for the Pirates, financially speaking. Given that salary, it's a surprise to see that the Reds didn't place a claim to block the Pirates from acquiring him. Cincinnati is just 3.5 games out of first in the NL Central while the Pirates are a half-game back of the Cardinals. All three NL Central teams would be in the playoffs if the season ended today, but the Reds and Pirates would face each other in the one-game Wild Card playoff. Buck, 33, has cooled off considerably following a meteoric start that saw him club 10 homers in his first 25 games (23 starts). Since May 1, he's hitting just .206/.290/.302 with six homers, and he's owed $1.1MM. However, with McKenry out for the season following surgery to repair a torn meniscus, his pop and veteran leadership should be welcome additions for Pittsburgh. Buck has also caught a strong 30 percent of potential base-stealers. Herrera, 19, is having a strong season at Class-A West Virgina. The Colombian infielder is hitting .265/.330/.421 with 11 homers and 11 stolen bases in 479 plate appearances. Herrera ranked as the No. 20 prospect in the Pirates system prior to the season, according to Baseball America, and his solid play in 2013 has him currently ranked 11th among Pirates prospects by MLB.com's Jonathan Mayo. In their scouting report, BA noted that Herrera has plus speed and surprising power for someone of his size (he's listed as 5'10" and 150 pounds) with the ability to hit the ball to all fields. BA feels that his lack of arm strength will limit him to second base, and Mayo agrees. Mayo adds that Herrera had no problem adjusting to the game after coming to the United States, and he projects an above-average hitter and well-above average runner. Mayo also ranked Herrera as the ninth-best second base prospect in all of minor league baseball. ESPN's Adam Rubin was the first to report that Byrd and Buck were headed to Pittsburgh (on Twitter), and MLB.com's Anthony DiComo was the first to break that the Pirates were giving up Herrera and a PTBNL (also on Twitter).